PRIMARY school children are being taught climate change will bring “death, injury and destruction” to the world unless they take action. The concept of climate change is being taught to school students and used to underpin environmental studies in classrooms across Australia. Resource material produced by the Federal Government for primary school teachers and students says climate change will cause “devastating disasters” in Australia. “As well as their terrible impact on people, animals and ecosystems, they cause billions of dollars worth of damage to homes and other buildings,” the material says. Psychologists and scientists yesterday slammed the lessons, accusing educators of being alarmist, creating unnecessary anxiety and endangering children’s mental health. Sue Stocklmayer, director of the Centre for the Public Awareness of Science at Australian National University in Canberra, said climate change had been presented as a doomsday scenario. Dr Stocklmayer said she was not a climate-change sceptic [everybody has to say that, or else they would be ostracised, branded a denier and silenced – Ed] but worried “too much time was spent presenting scary scenarios, especially to young people”. None of this should surprise us. The government simply recycles the IPCC line without a second of critical thought. And do you expect the government to care about the chidren’s welfare? In a word, no. All they are concerned about is indoctrinating another generation of children to believe their lies, spin and exaggerations on climate change, so they will stop thinking for themselves and turn into brainless zombies – at which point they will meet the requirements to vote Labor and join GetUp. The link to the government material for primary schools is here – have a click around, it’s an eye opener to think our children are being exposed to this. 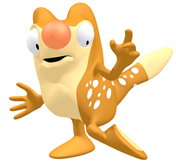 By the way, Marty the spot-tailed quoll is endangered partly because of climate change, apparently. When will we be rid of these accursed religious NUTTERS? ‎”young people who don’t have the cognitive maturity and emotional maturity to process this stuff” – not only young people. If a majority of adults had such maturity the hoax would have died out within weeks, not still be going after more than 20 years. ‎”Australian National University’s Centre for the Public Awareness of Science director Dr Sue Stocklmayer said … she was not a climate-change sceptic” – if she is not a sceptic she has no place in science and should immediately resign or be sacked. “Science” is in a poor state when, as you say, the opposite of scepticism is needed to continue careers in it. did a blog on something similar and still have ‘them’ preaching at me that I got it wrong. 1. ‘children’ apparently dont have minds–and re-gurgitate rather than consider what is presented to them. SHOULD require a compulsory visit to any school setting. What can you expect when you have David Marr saying a couple of weeks ago “we’re all going to fry”. This is the sought of remark that lefties excel at. Notice how the information presented to secondary students is identifal to that for primary students. What, are they concerned that any more detail the the older ones might start asking questions? Human Induced Climate Change and all its associated alarmism. what will be next? Alien invasion? Sporks? People with shoe sizes above 10? Both quotes from the outstanding Joseph Stalin. The only reply to such an uninformed statement is would you suggest we sell uranium to an unstable Muslim nation? Syllabus censor John Howard couldn’t fault the grand idea. At least we may dismiss Stalin by understanding that when the Church and the State couldnt exist without slavery [such was the Romanov definition of educated until 1881]–then the naughty things decided to follow every other European nation that also had long suffered its fools. then we can either rest assured that Rudyard Kipling’s imposed imperial-slavery idea and convincing the Indonesians that they should read more Harry Potter rather than shooting Javanese–will of course save the day. How criminal Joseph Stalin must have been for supporting and saving British lives. Note – Vladimir Lenin always advocated using schools as a preferred indoctrination route. “An important goal of Communist propaganda was to create a new man. Schools and the Communist youth organizations, like Soviet pioneers and Komsomol, served to remove children from the “petty-bourgeois” family and indoctrinate the next generation into the collective way of life. The idea that the upbringing of children was the concern of their parents was explicitly rejected. Is the climate change Big Lie just the govt trying to “rescue” children from the “evil” lies of parents and common sense? There is a simplistic that should refute the logic being offered. If we have been fortunate enough to have read Brave New World–we see that individuals simply do not ‘ exactly or identically become indoctrinated–by exposure. If this was remotely true–then we would all gain the same marks in each and every exam–given we attended the same courses. Vladmir was certainly not in tune –but in 1920–the Soviets didnt require–(much as today)– hostile factions covertly armed by British and American forces–creating ‘educated solutions’–that the whole world supposedly descends into chaos without. Care to explain why the Enclosure Acts benefited the English population by seizing common land?? Tremendous stuff paul–any one that expresses an opinion and is in the public arena is on the take!! You’d then be a ‘tall poppy’ or ‘green- to-the-gills’ fanatic then– would you?? on the flip side , if we as climate cynics express public opinion we get labeled ‘climate deniers’ & threatened to be tattooed & gased ? what’s with that ? Every time a new number, a new science paper, ea new nasa discovery or anything else comes out – that proves them to be continually lying – write about it – spread the word, email you politicians……. they are wrong, they are trying to screw us, if they succeed who else do we have to blame? Don’t matter if you are in Canada, USA, UK, NZ or Ozzy Land….. we can fight together. Hi paul–a cynic is far easier to reply to than a ratbag. Though–its pretty obvious that skeptics–wouldnt you say– have something that doesnt work. coming from generations of farming families & a rural back ground i think i might have a bit more of a practical handle on the environment than most city people . you seem to be singling me out in this forum , any particular reason why ? are your public eye climate activist heroes losing their credibility ? There’s a problem with the rural whelp–and that is they dont mind 40% of their produce never being sighted by the population. Regards being singled out–it must be ‘the climates fault’. I dont have any class or guilt problems–discussing issues. Would suggest that the only Roman opinion worth considering–is that if a nation cant feed itself–then it should forget it. So the ‘we need more export’ rally call– rather than generational economic benefit — becomes ‘concerns’ about the climate instead. Rural psyches have never had a problem claiming that One Pound per square mile per Year will about do -to produce the next generations future. Do we have to be Einstein to see why 40% less opposition allows the buffoons to claim they are the back-bone of the country? i dont remotely see what you might be on about. All that is being singled out–is that if slash and burn techniques have created a rural mess—then permitting the same concerned folk the ability to now chemically poison the food-chain– solely because they know ‘about the climate’–is just not on. Closed Local Government is the sole cause–‘disenfranchised’ by your own neighbours in other words. I cant wait to be hear how tough the export markets are while paying for their unemployed children. Anyone else–climate affected as well?? slash & burn is no longer a responsible farming practice as you well know , we,re not all dumb hick rednecks , we are doing our bit , planting trees around unusable parts of farmland such as fence lines , waterways & low level areas that would otherwise become salty , a farmer in the wimmera has been trialing piping his diesel emissions in to his seeder box to get nitrogen in to the soil with good results ( wait for it ,,, ” nitrogen ! you can’t do that it’s pollution ” ,,, no , it’s not , it’s an essential nutrient – just as carbon dioxide is essential to all plant life) you don’t like the way your food is produced , ? try growing your own resources in your backyard & feeding yourself , i bet you’d starve within a month . instead of believing everything you here at the yuppy down town cafe , get out in the real world & check it out for your self .